Write and run Python code instantly! Python Runner is a handy tool for learning Python and running Python script for daily tasks. Simply type Python code and press “⌘R” to run it, that is all! You don’t event need to save the file first! Python Runner is simple and quick. 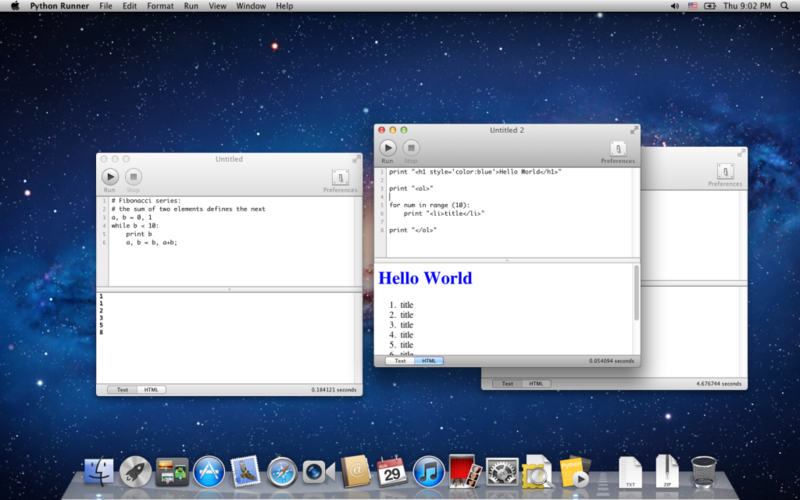 You can use it for daily tasks such as text processing, code generation or simply type some code to verify your ideas. I have downloaded Python3. How do I run Python3 with Python Runner? Your help is much appreciated. Hi Paul, please change the Python path in “Preferences -> General -> Python path”. You may need to add the Python binary/library directories to “Preferences -> Working Directories” in order to allow Python Runner to access them. It cannot process unicode characters ..